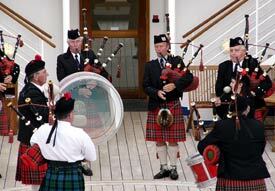 ABOVE: A pipe band entertains Silver Whisper passengers in Invergordon, Scotland. Production shows in the Viennese Lounge, a large showroom with a proscenium stage. These typically included male and female vocalists, an adagio couple (Karen Stone and Zoli Bihari), a male gymnast-dancer, and three female dancers. The lead singer, Rebecca Lowe, also performed a show of her own late in the cruise. A show by Ray Solaire, the Silver Whisper's legendary cruise director and an all-around entertainer who is best known for his remarkable (and unique) puppet show. An evening with entertainer/songwriter Richard Sherman, who--with his brother Robert--achieved fame with "Tall Paul" and other pop hits before writing the scores for Disney movies such as Mary Poppins. A concert by Vadim Brodsky, a Russian-born violin virtuoso who has performed with the Moscow Philharmonic and other major orchestras. "Enrichment lectures" on history, literature, and cinema by three university professors. Performances by a bagpipe band in Scotland and Irish musicians (including young Irish dancers) in Northern Ireland. A talented lounge duo called "High Society" and the ship's extremely versatile band, the Silver Whisper Quintet. Occasional movies with drinks and popcorn in the Viennese Lounge. In-suite entertainment options included videocassettes (which were available free of charge in the ship's library) and a new ISIS pay-per-view movie system that was being tested during our voyage.